TYME Iron Review: How to straight and curl hair with TYME Iron Pro? I think I will never stop experimenting with my hair and my clients’ hair as well (of course, if they joyfully accept this initiative). So you, my dear readers, are doomed to have a portion of a constant update on the up-to-the-minute information about tools and products for styling and treating your hair. My latest hair obsession attack was caused by the innovative TYME Iron Pro which helps you create both straight hair and curls. I have already checked so many other straighteners, but this one is really special. I was eager to try it on my own as I read so many TYME Iron reviews on the Internet. So I borrowed TYME Iron Pro from my friend who is also a hairstylist for a while and started testing it. TYME Iron Pro gives unlimited possibilities of hair styling as it can either straighten and curl your hair. Is it convenient in use? Does TYME Iron Pro damage your hair? I couldn’t resist the temptation to write my own TYME Iron review and give you all the needed answers. So here it is, my TYME Iron review because there’s so much you need to know about this excellent tool. Isn’t it enough to take an interest in TYME Iron Pro? Let’s move forward if you want to know more details about this terrific TYME product. 2 How does TYME Iron Pro look? 3 How does TYME Iron Pro work? 4 How to start with TYME Iron Pro? 4.1 TYME offers you a free video lesson with a professional hair styler. 5 How to achieve an ideal straightening and curling with TYME Iron Pro? TYME products are the creation of a family business. All the devices and cosmetics by TYME are made with the customers’ needs in mind to help them achieve the outstanding results in hair care and styling. Nowadays TYME performs a wide range of products for your hair from brushes and dryers to thermal protectants and hairsprays. TYME Iron Pro is one of the latest company’s inventions by Jacinda Smith. When developing the device, Jacinda took into account the shortcomings of the previous iron model which is named simply TYME Iron (without “Pro” which really makes a sense). She also made her best to adapt the pro modification for everyday and traveling styling needs. TYME Iron and TYME Iron Pro achieved global popularity. These tools are available in 32 countries worldwide which speaks of the successful implementation of the company’s idea: to give every woman using it the understanding of her unique beauty. How does TYME Iron Pro look? This is probably my favorite part of the TYME Iron review. I will take the liberty to assume that many women start wanting to possess the TYME Iron due to its adorable design. I could describe its external features for ages. The smoothness of the device lines, the thought-out details, and the light pink metallic coloring with shimmer make TYME Iron Pro a perfect tool in terms of visual performance. The device is manufactured of quality materials. It has the inscription TYME made with the capital letters on the side. But the letters are so elegant and unobtrusive that they do not take the focus from the overall design. 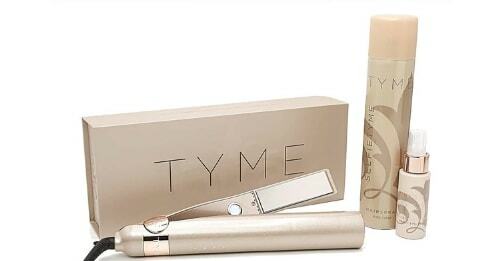 I think the best word for describing TYME Iron Pro design is ‘luxurious.’ This is the tool which deserves a separate place on your dressing table in the boudoir. It will definitely catch the ruptured eyesights of your girlfriends. And due to this beautiful appearance, you want to grab it in your arms and create something impressive for your hair. Thank goodness, the attractive design corresponds to the decent features of the device. Isn’t it a perfection, when something so beautiful is also functional? How does TYME Iron Pro work? TYME Iron Pro is claimed to be innovative and revolutionary regarding styling hair. First of all, it combines the functions of both an iron and a curler. As-a-matter-of-fact, you can use it for all the styling needs. The multifunctionality of the device is achieved with the best technologies used when developing. I’ve already mentioned, that TYME Iron Pro is the second generation TYME iron. It took all the best from the first one and added a bunch of features to become more useful and more professional indeed. TYME Iron Pro has five temperature settings so that you get a possibility to set the needed heat regime precisely to your hair needs. You can select one of the available from 300°, 325°, 350°, 375°, and 400° F.
According to some researchers, the ideal temperature for styling is 365° F. But I would recommend you to take your hair type into account. The thinner your hair, the more delicate regime of styling it requires. If you have fine, damaged or chemically treated hair, iron at the lowest setting which is 300°. The normal hair requires 325° — 350° for straightening or curling. If you are the possessor of curly, coarse, and thick hair (especially it concerns the Afro-American hair), your perfect styling temperature varies between 375° and 400° F.
TYME Iron Pro offers 5 temperature settings to set the heat regime suitable for your hair type. TYME Iron Pro has titanium plates which are considered to be the best for professional hair styling. They warm up faster than tourmaline or ceramic plates and provide the even heat distribution. Being an ionic metal, titanium produces lots of negative ions when heated thereby keeping a natural level of moisture in your hair and reducing freeze. When properly used, titanium irons do not damage your hair and make it shiny and silky with the ionic technology. 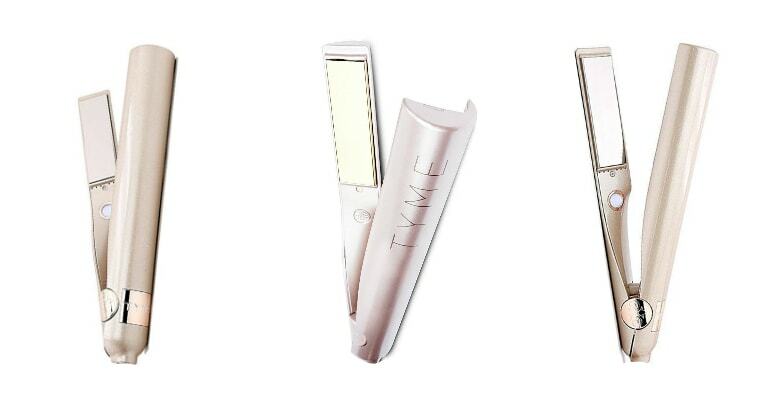 TYME Iron Pro being a titanium flat iron keeps the natural level of moisture in your hair. Titanium is a material strong as steel and lightweight at the same time which makes the titanium flat irons the best solution for travels. So you can take your favorite TYME Iron Pro wherever you go with you. With titanium plates and five temperature regimes, TYME Iron Pro suits all hair types needs from thick to coarse. TYME Iron Pro is also convenient in use. All the temperature regimes are displayed on a small LED light screen. You won’t get your hair burnt, as these tiny ciphers on a screen won’t let you mix up with the needed heat settings. The device will automatically shut-off if it is not used for 30 minutes. That feature makes TYME Iron Pro a safe device. With the swivel cord that rotates 360 degrees, the process of styling gets even more convenient. TYME Iron Pro will automatically shut-off if not used for 30 minutes. Developed for comfortable and safe use TYME Iron Pro is still a professional device. That is why it has an army of fans among salon hair stylists. If you hesitate whether you could handle this tool if you are not an expert, then calm down your worries. The TYME Iron Pro developers took care of you and attached a special bonus to the purchase. You’ll get a free lesson from a virtual stylist to deal with your freshly-bought iron. How to start with TYME Iron Pro? So you received this topnotch iron from TYME, took it from a beautiful packaging, and froze with admiration of how immaculate it is. When the first wave of admiration from TYME Iron Pro design passed, you hurry up with testing it on your locks. From TYME Iron reviews, I knew that this iron doubles up with options of straightening and curling your hair. So the first thing is to determine, what kind of the hairdo you want to get. Would it be sleek and smooth perfectly-straighten hair or would you prefer curls? In the latter case, you also need to decide what kind of waves you want to get. After resolving with a hairstyle, you make your first attempts with the iron. But handling this device is not as easy as you could imagine. TYME Iron Pro requires some skills to be used efficiently and with ease. So you need to train a little bit if you want to be as nimble as a hairstylist. I need to confess, my first attempts were rather unfruitful. As titanium plates heat up literally in seconds, I could perform a fast and decent straightening in about 15 minutes. But styling curls wasn’t as easy. In order to avoid hair burning, I was forced to make fast moves with a curler. But the result wasn’t satisfying at all. So I decided to read some TYME Iron customer reviews. A lot of users complained about their endeavors with curling styles. And that is really the techniques you need to get grips with. But there’s a little trick we can all use to learn how to handle TYME Iron Pro. TYME offers you to get a free video lesson online, and it’s huge support in the initial stage of using the device. TYME offers you a free video lesson with a professional hair styler. To schedule a lesson with a professional hairstylist, you need to select a person from the list of available stylists, book an appointment for a particular time and date, and decide whether it would be a Skype-call, a FaceTime or a Google Hangouts session. Complete the appointment by sharing your personal data and get the 30-minute interactive lesson from a professional. I must say, the TYME stylists know their business perfectly and also know how to share this secluded knowledge of TYME hair styling with others. After a session and a little bit of practice, I finally achieved my perfect curls with TYME Iron Pro and was absolutely happy. This brief manual will be useful even for a professional hairstylist. So do not ignore the opportunity to get such a lesson. These thirty minutes will become a significant investment in your future sparing time with TYME styling. How to achieve an ideal straightening and curling with TYME Iron Pro? Now you know how that to save your mornings and get the fast and inch-perfect results with TYME Iron Pro you need a little bit of theory and practice. I decided to complement the theory from TYME stylists with the tips for the appropriate hair styling. 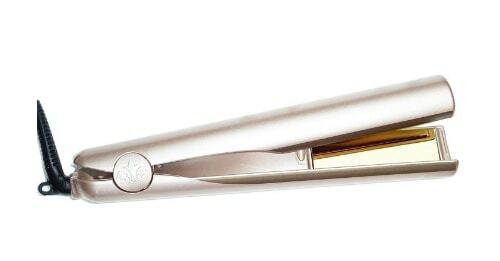 Use a high-quality flat iron to reduce hair damage and maintain your locks shiny and smooth. This is the primary recommendation which every hairstylist will give you. And we positively fulfilled it: we’ve got the TYME Iron Pro which is one of the best items on the market of irons. It will save your hair’s beauty and will serve you for quite a long time. Prepare your hair for the heat impact. No matter how good or professional your iron is, you still need to prepare it for styling sufficiently. That considers using a styling product to protect your hair and drying your hair thoroughly before using an iron. Do not use an iron on wet hair! With the vast assortment of hair cosmetics, you’ll have no difficulties with selecting a thermal protectant or a styling product suitable for your hair type and condition. When looking for a product, avoid those with natural oils. They are good only after using an iron, not before. Apply the selected product on your locks then dry them with a blow dryer or naturally. Didn’t I say, it needs to be clean hair. So the perfect time for styling manipulations is right after washing your hair. Work in layers when straightening your hair with an iron. Take your TYME Iron Pro and begin with the bottom layer of hair. You can clip away the rest of your hair to concentrate on the particular strands. The most efficient method is to iron one-inch piece of hair and move with your iron to another section gradually. Make sure that each strand is straight enough to move to the next one. If you are not satisfied with the straightening, then maybe you take larger strands or your hair is too thick. Make the strands for ironing less dense — it is better to straight them at once without repeating. From the bottom layers move to the layers of hair above. It’s a bit durable strategy, but the result is worth it. When ironing is finished, you can apply the product that will maintain the shine and keep your hair in place. This can be a serum or a spray precisely for your hair type. It will prevent you from static hair after straightening. All types of curls that are fast, long-lasting, and attractive can be achieved with an iron. TYME Iron Pro was developed for curling along with straightening, so you can get your desired hairdo from lazy curls to red-carpet waves by using your TYME Iron for the particular kind of styling. My favorites are mermaid waves. And you can get any curls with TYME Iron Pro just following these simple rules. The same as in the case of straightening, you will need a thermal protectant. Use the same scheme as I described above. Utterly clean and dry hair is your must before you start applying a protecting product and then styling your hair. When your hair is prepared, divide it into vertical sections. You can clip away the strands which are waiting for their time to be curled. If you have a thick hair, you should divide it even more thoroughly. I would recommend to split it into halves horizontally. Separate the locks from ear to ear and clip away the top. The same as with straightening, start with the bottom layers. Take your TYME Iron Pro and clamp down the first separate section of hair. Then slide the iron along each strand and rotate it continually for a total of one-half of a turn. You should also keep some tension on the hair, but do not clamp it with the iron for more than 10-15 seconds. Do not clamp your hair with the iron for more than 15 seconds. Each time you reach the hair tips, you need to release your hair from the iron. You can twirl every curl with your fingers to give each wave or curl the desired direction. Once you’ve finished the styling, let your curls cool down. After a while, you can blend them manually and apply some styling for perfect volume and shape of your curls. Both for straightening and curling, you need a little practice and consistency. With TYME Iron PRO, you don’t need to puzzle over a hairdo. Practicing and making styling experiments will lead you to a hair perfection with TYME. 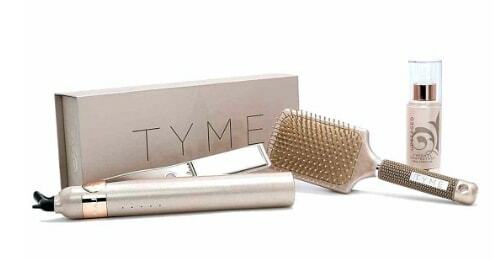 TYME Iron PRO is a topnotch device for styling your hair. It is equipped with a bunch of professional features for irons which help you achieve any hair styling. At the same time, it is expensive and rather difficult in handling. So let’s weigh all pros and cons to decide finally: is the game worth the candle? Titanium plates with ionic technology to save you from an overdried hair. Straightening and curling with one device. Five temperature settings to find the appropriate one for your hair needs. Safety with an automatic shut-off after 30-minutes of non-use feature. Online tutorial from the TYME professional hairstylist. Provides fast and even heating. The price of the device is $200. It is much more expensive than the irons with similar features. This iron is difficult to use at the beginning. If you are not a professional hairstylist (and sometimes, even if you are), you probably won’t be able to handle it properly right after buying. You’ll need to practice and watch some tutorials to manage it. I definitely loved using TYME Iron PRO. After a few attempts, I finally managed how to handle it properly and learned to create all kinds of curls including my favorite mermaid waves. There was no problem when using it for straightening at all. But the time has come, and I need to return this iron to my friend. Would I buy it for a personal use? At least, not now. Until my Remington Shine Therapy Straightener straightens my hair normally, I hesitate on buying a new device for $200. Still, there is a temptation to buy a device which combines the functions of iron and curler. And it could be a good purchase for a professional hair styling. If this idea also tempts you, please treat yourself with such a luxury gift and forget about bad hair days with TYME Iron Pro. Thank you, Monica! I’ve read a lot of TYME curling iron reviews but there is nothing better than your one! All the functions and tips are described here and I’ve found all the answers to my questions. I received my TYME iron as a gift and I used it as a hair straightener. Due to your review now I have an opportunity to make some experiments with other hairstyles. And all I need for it is just one tool! I think TYME hair straightener is a real treasure for every woman who doesn’t want to waste her money on a big amount of tools and products. Your welcome, I hope you’ll find my other reviews on sites helpful as well! The description of those TYME tools really attracted me because of the opportunity of making both curls and straight hairstyles. But I haven’t tried anything like it before. Monica, can you tell how to use tyme iron right? Are there some additional tips I need to know? Thank you for your comment. I have plans to cover more tips on how to use TYME tools in the future, so follow my updates to be the first to read my new post about it. Thank you very much, Monica! Other TYME iron reviews I’ve found on the web just can’t be compared with that awesome article you’ve shared with us, nicely done! As for the tool you described here, TYME iron pro is really convenient, easy to use and can deal with any kind of hair. The only thing you shouldn’t forget about is to use enough moisturizer with it because there is always a risk of overheating your hair. I like my TYME hair straightener because it’s compact, convenient and easy to use. When I purchased the device I fell in love with it at once because of the awesome design and amazing hair styling features. Thank you for such a nice review, Monica. I am a big fan of your blog and I read every new article you share with us. I hope you will pay more attention to this awesome tool in the future, hoping to check out some more TYME style reviews from mystraightener soon.